The Grand Courts house both European art, from the Renaissance to Impressionism, and Australian art, from colonisation to the end of the 19th century. 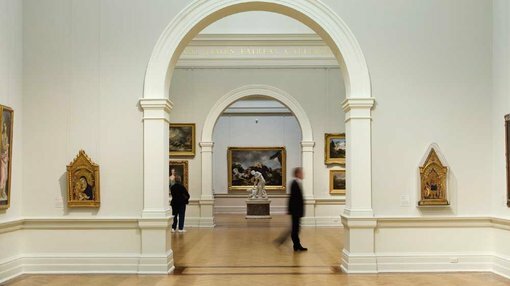 These elegant rooms were the first parts of the Gallery to be built in 1897. Although there are 13 courts in all, including the entrance court, the Grand Courts usually refers to 15th–19th c European art, 19th c European art, 19th & 20th c European art and 19th c Australian art. On your right you will see three large archways. These are 19th c Australian art, 19th c Australian art and 19th & 20th c European art, and lead through to 15th–19th c European art and 19th c European art. On your left you will see three large archways. These are 19th c Australian art, 19th c Australian art and 19th & 20th c European art, and lead through to 15th–19th c European art and 19th c European art.